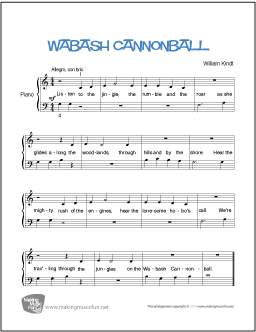 The American folk song popularly known as Wabash Cannonball was originally written as The Great Rock Island Route on the earliest sheet music found for the song which was composed by J.A. Roff, to whom the song has been historically credited. The song is considered to be the oldest in The Rock and Roll Hall of Fame’s 500 Songs that Shaped Rock and Roll. Over the years, there have been many versions of the song, but they all retain more or less the same chorus. The most famous renditions were the ones from Roy Acuff, Bing Crosby, and Johnny Cash. Here’s an awesome arrangement of ‘Wabash Cannonball’ for beginner piano solo. There’s an mp3 on the site that piano students can listen to as they practice this piece. The arrangement is available to print in PDF format. Ultimate-Guitar.com has guitar chords for ‘Wabash Cannonball’. This site features many tools to make learning and playing the guitar fun, including an auto-scroll tool for hands-free guitar chords/lyrics advancing, and a transpose tool in case the music isn’t in the right key for your voice. Check out this awesome video for ‘Wabash Cannonball’ from vintagemusictv on YouTube. Watch it or sing with your kids! The Cobbler, Cobbler is a mother goose nursery rhyme about a cobbler and a rather impatient customer. And I’ll give you half a crown. And I’ll pay you a shiny crown. Here’s an awesome arrangement of ‘Cobbler, Cobbler’ for beginner/easy piano solo. There’s an mp3 on the site that piano students can listen to as they practice this piece. The arrangement is available to print in PDF format. Check out this amazing video for ‘Cobbler, Cobbler’ from Geethanjali Kids – Rhymes and Stories on YouTube. Watch it or sing with your kids! Curly leaves all dancing when the wind blows. Loo-lee-loo, when the wind blows. For the silver flutes I need branches. I will make a tingling balalaika. I will think of you, my lovely birch tree. Here’s an awesome arrangement of ‘Beriozka (The Birch Tree)’ for easy piano solo. There’s an mp3 on the site that piano students can listen to as they practice this piece. The arrangement is available to print in PDF format. Check out this awesome video for ‘Beriozka’ from The Singing Bell on YouTube. Watch it or sing with your kids! Alouette is a popular French Canadian children’s song commonly thought to be about plucking the feathers of a lark. The song was first published in A Pocket Song Book for the Use of Students and Graduates of McGill College in 1879. Canadian folklorist Marius Barbeau suggested that the French colonists used songs like Alouette to dip their canoe paddles in unison. Although a French song, Alouette is well-known throughout the world. This is due in part because Marines and other Allied soldiers learned the song while serving in France during World War I, and then passed it on to their children and grandchildren. Lark, lark. Ah! Ah! Ah! Ah! Here’s an awesome arrangement of ‘Alouette’ for beginner piano solo. There’s an mp3 on the site that piano students can listen to as they practice this piece. The arrangement is available to print in PDF format. Check out this wonderful video for ‘Alouette’ from HeyKids – Chansons Pour Enfants on YouTube. Watch it or sing with your kids! The Battle Hymn of the Republic, also referred to as “Mine Eyes Have Seen the Glory” was written by American poet and author, Julia Ward Howe. For the tune, Howe used, John Brown’s Body, an American marching song about the American abolitionist, John Brown. Battle Hymn of the Republic is frequently used as an American patriotic song. Here’s an awesome arrangement of ‘Battle Hymn of the Republic’ for beginner/easy piano solo. There’s an mp3 on the site that piano students can listen to as they practice this piece. The arrangement is available to print in PDF format. Battle Hymn of the Republic for Beginner/Easy Piano Solo. Check out this amazing video for ‘Battle Hymn of the Republic’ from The United States Army Field Band on YouTube. Watch it or sing with your kids! “The Campbells Are Coming,” is a Scottish bagpipe hymn associated with the Campbell clan, a Highland clan. “The Campbells Are Coming” was composed around 1715. There are several theories about its origin, but the most popular theory suggests that the tune was inspired by the war of the Jacobite rising of 1715. It was played by the vanguard of the loyalist Scottish troops as they marched in opposition to the Jacobite rebels. And saw three bonnie perches play.The Campbells are comin, Oho! Oho! The Campbells are comin Oho, Oho!The Campbells are comin, Oho! Oho! Here’s an awesome arrangement of ‘The Campbells Are Coming’ for easy piano solo. There’s an mp3 on the site that piano students can listen to as they practice this piece. The arrangement is available to print in PDF format. Check out this amazing video for ‘The Campbells Are Coming’ from Some Folk on YouTube. Watch it or sing with your kids! The classic nursery rhyme, “Cackle, Cackle, Mother Goose”, dates from the 1600s and is a classic Mother Goose Nursery Rhyme. The word “cackle” is an onomatopoeia for the sound that a goose makes. Here’s an awesome arrangement of ‘Cackle, Cackle, Mother Goose’ for easy piano solo. There’s an mp3 on the site that piano students can listen to as they practice this piece. The arrangement is available to print in PDF format. Check out this fun video for ‘Cackle, Cackle, Mother Goose’ from Vintage Nursery Rhymes on YouTube. Watch it or sing with your kids!